Dr. Mustafa Kabeer was the first physician to perform pediatric lung resection in the world. He was the first physician to perform robotic surgery at CHOC and has since performed many robotic tumor resections. Dr. Kabeer is one of only a few surgeons in the region who performs minimally invasive pectus excavatum surgery, also known as the Nuss procedure. Dr. Kabeer is at the forefront of investigating new and innovative ways to treat patients, and he has been a leader in the research of surgical robotics. In addition to robotic surgery, Dr. Kabeer’s clinical interests include neonatal surgery, perinatal counseling, pediatric laparoscopic surgery and hernia surgery. 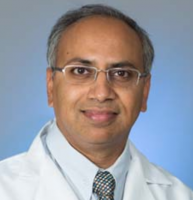 For over 10 years, Dr. Kabeer has been engaged in the investigation of the use of autologous splenic lymphocyte reinfusion to augment vaccine efficacy against gram negative encapsulated organisms. He has a background in tumor cell vaccine and cytokine research and is interested in working with stem cells in order to grow small intestines. He is currently researching the use of Raman spectroscopy in the diagnosis of pediatric tumors and in the diagnosis of Hirschsprung’s disease. Dedicated to clinical excellence, Dr. Kabeer is board certified in general surgery, pediatric surgery and surgical critical care. Prior to joining CHOC, Dr. Kabeer attended medical school at the University of Missouri, Columbia. He completed both his internship and his residency training at Indiana University and served his fellowship at the Children’s Hospital of Michigan.